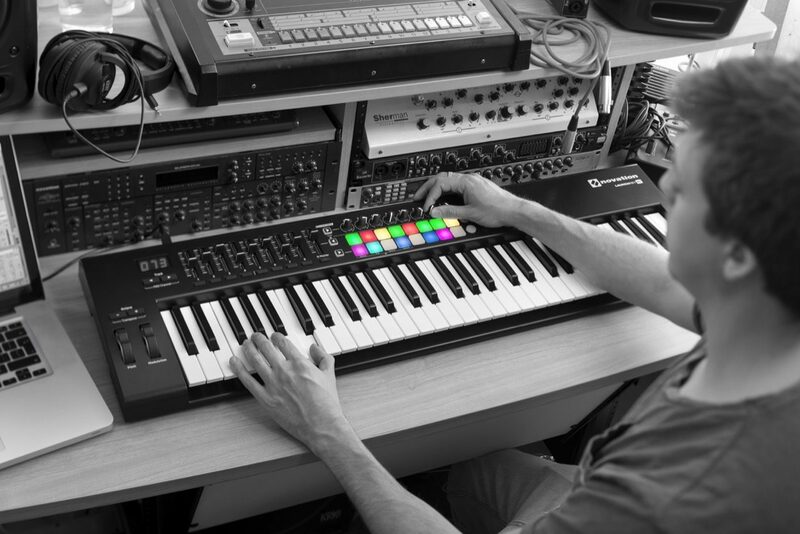 This latest generation of Launchkey is Novation's most focused MIDI keyboard controller for Ableton Live. It's the quickest and easiest way to produce and perform electronic music - because they designed it specifically for the purpose. You just plug in via USB and the keys, faders, knobs and pads immediately give you hands-on control of your grid, instruments, effects and mixer. Of course, if you don't use Ableton, it will map to other major music software too using InControl. Use Melodics to improve your keyboard skills and hone your pad drumming skills for free. - Novation Bass Station software synth -- virtual version of Novation's classic bass synth. 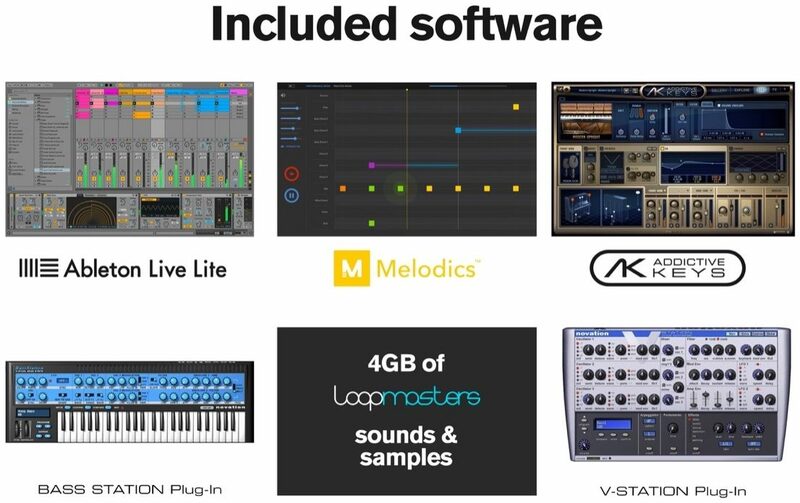 - Novation V-Station software synth -- powerful virtual polysynth with tons of great presets. - Addictive Keys -- choose one model from the pro-grade XLN Audio lineup. - Loopmasters Loops and Samples -- 4GB of content spanning multiple genres. - Free keyboard lessons from Melodics. - Fully USB bus powered on Mac or PC. - Camera connection kit or USB camera adapter required for use with iOS devices (not included). Power supply must also be used (not included). "Great controller with great functions." Overall: This is my first MIDI controller. I'm new to home recording, and DAWS, and all stuff like that so please excuse my lingo if it's not correct. I did ALOT of research before deciding to go with MK2. I love the seamless integration with Ableton. The slider/faders are pre assigned to the track volume. The buttons below them activate and deactivate the tracks. The eight knobs are pre-assigned on virtual instrument, plugins, effects, etc. The 16 trigger pads feel great and the lighting is super freaking cool. The keys feel like butter. Like damn you should see me play them...they make me sound like I can play with ANY band in SWFL. Anyways...this controller does everything that it says it does, nothing more, nothing less. For the price you can't go wrong. I'm extremely happy with my decision. Hope this review provides some insight to y'all that are looking for a MIDI controller that won't break the bank. 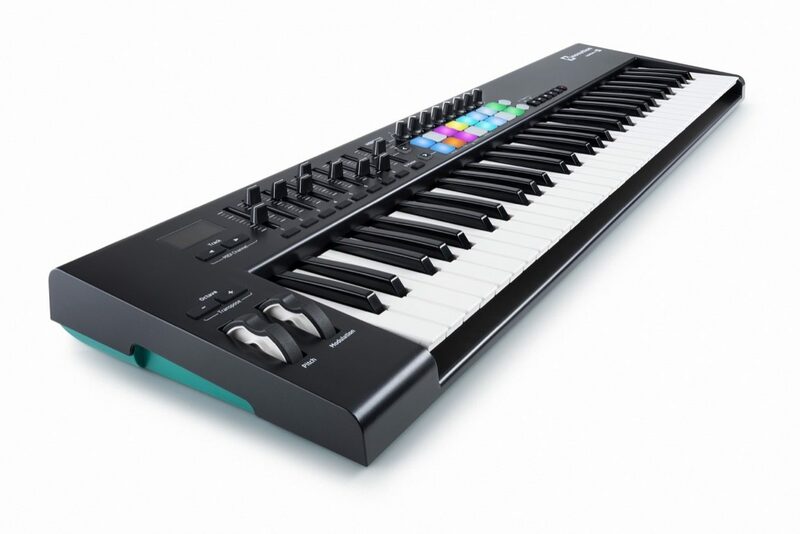 Overall: Excellent for a small home studio, keys seems to be not very sensitive sometimes you have to hammer a little bit but out of that is an excellent keyboard.